Mon, Apr 15, 2019, 08:58 pm SL Time, ColomboPage News Desk, Sri Lanka. 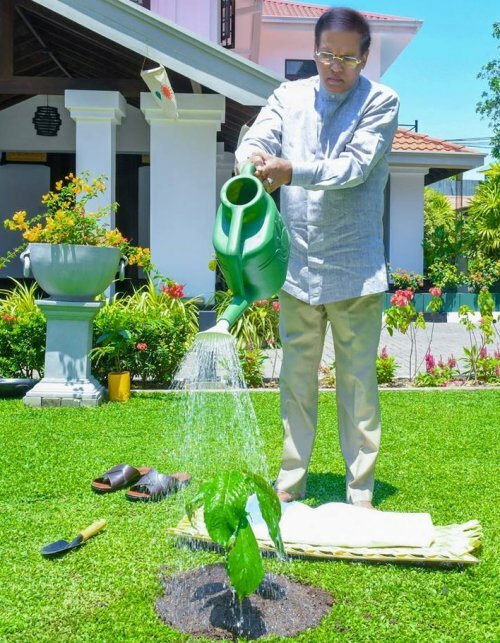 Apr 15, Colombo: Sri Lankan President Maithripala Sirisena introducing a new custom this year to the Sinhala and Tamil New Year rituals has planted a tree for the conservation of the environment for future generations. 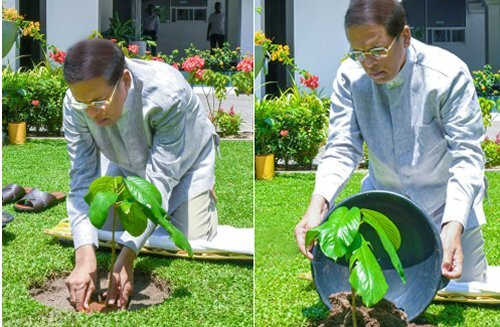 Observing the new custom, the President, wearing white clothes and facing the East planted a sapling of a fruit tree at the auspicious time 11.17 a.m. this morning (15) at the President's official residence. The President also urged the entire people of the country to celebrate the dawn of the New Year with the new custom today an fulfill their responsibility to preserve the environment as the significance of the environment conservation for the future generation is felt more than ever before. Saplings of indigenous trees such as Nedun, Satinwood, Na, Hora and Kumbuk were distributed free by the Department of Forest Conservation to be planted island-wide.